NASA’s Lunar Atmosphere and Dust Environment Explorer (LADEE) probe successfully achieved orbit around the moon on Sunday, officials from the US space agency confirmed earlier this week. LADEE blasted off from Wallops Island, Virginia on September 6, beginning the first leg of a month-long journey to the moon aboard a Minotaur 5 rocket. The probe entered Earth’s atmosphere in a highly elliptical orbit, circling the planet three times. 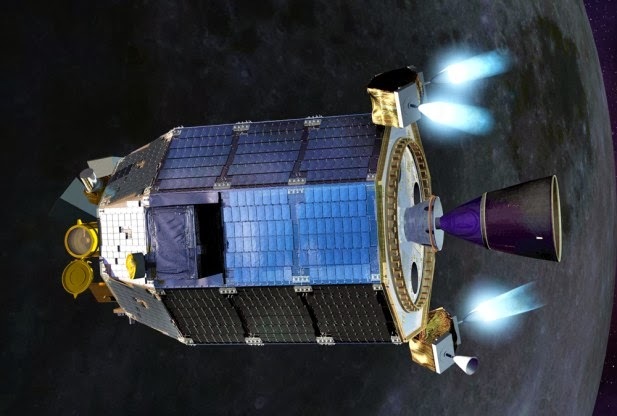 Finally, on Sunday, LADEE was in position to fire its breaking rocket, which helped slow the probe down enough for it to be captured by the moon’s gravity. The spacecraft, which is just under eight feet tall and less than five feet in diameter, fired its liquid-fueled engine at 6:57am EDT for a period of four minutes, said Stephen Clark of Spaceflight Now. The first of two major orbit adjustment burns, designed to lower LADEE’s orbit and eventually resulting in a near-circular orbit approximately 155 miles over the moon’s equator, was scheduled to take place on Wednesday. The other is set for Saturday. He added that the US government shutdown is not expected to affect a laser communications exhibition LADEE is scheduled to put on later this month. Once it reaches the 155-mile orbit mark, ground control will begin operations using the three scientific instruments on the probe, as well as deploying aperture covers from the sensor and activating the laser for that forthcoming 30-day high-speed optical communications demonstration. During the display, the spacecraft will be communicating with ground stations in New Mexico, California and the Canary Islands. Once the systems are linked, LADEE will be able to receive tens of megabits of data per second from the Earth or send hundreds of megabits per second from the moon back to the Earth. Those speeds are unattainable with most current radio communications systems, according to Don Cornwell, the laser communication demonstration mission manager from the Goddard Space Flight Center in Greenbelt, Maryland. NASA is looking for a way to increase download speeds for data originating from space, he told Spaceflight Now. Ideally, the US space agency is hoping to be able to transmit high-resolution images and 3D video footage from satellites that orbit the Earth, as well as from vehicles that travel to the moon or into deep space.